D.L. 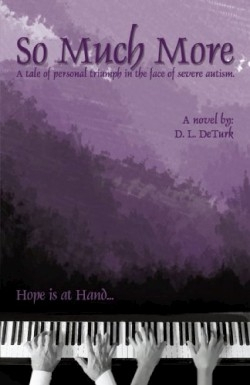 DeTurk a diagnostic radiologist displays sensitivity and knowledge of the mentally disabled in this touching tale of an autistic young man whose future turns hopeful. Nicholas was diagnosed as severely autistic around age two. As is typical he withdrew into a silent world unable to connect with people. His mother wrapped herself in Nicholas’s care; his father distanced himself and stopped trying to communicate with his inscrutable son. Except for meeting his physical needs the staff at Mariposa Manor has largely ignored Nicholas. He spends his days standing in the hall rhythmically rocking eyes on the floor. This changes when a friendly group of three student nurses rotate into the duty schedule at the manor. Kelli one of the students plays the long ignored grand piano in the music wing when she’s off duty. Her grandfather a custodian at the facility lets her into the empty concert hall while he sweeps and polishes nearby. Nicholas drawn by the music joins Kelly on the piano bench whenever she plays. His autistic rocking abates when she plays and more surprising he can play anything Kelli can; his fingers mimic hers an octave lower on the keys. When it becomes clear to Kelli that music is the key to reaching Nicholas she enlists help from her nursing friends who get involved bringing about a positive change in Nicholas’s appearance and behavior. Other patients and staff play a supportive role. The head orderly an egotistic young man with his jealous eye on Kelli tries to make trouble for Nicholas but what could have been a moment of tension is glossed over in a paragraph or two and the expected happy ending ensues. So Much More should pack an emotional wallop but it lacks drama. DeTurk is a “teller” rather than a “shower”; he leaves nothing for the reader to deduce and no need to draw conclusions or wonder about a character’s motives. An omniscient narrator who relates what each character is thinking and doing stereotypical characters and stilted dialogue dampen the impact of a good storyline. Still the story has charm and warmth that spring from the hopeful message DeTurk conveys: music has the power to touch the inner spirit and there is always hope for healing when compassionate people get involved. The message delivered with care and sensitivity provides hope particularly as current research continues to confirm positive results for autistic people treated with music therapy.